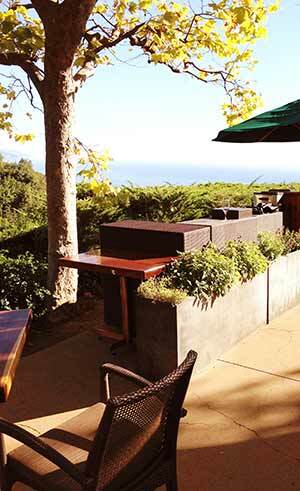 Finding the best Big Sur Restaurants especially during prime vacation season, can sometimes be a challenge if you are not a frequent traveler to this gorgeous small slice of the California Pacific Coast. 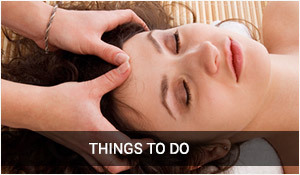 But there are a few restaurants, some not so well known, that can made your time here memorable! Restaurants in "Big Sur" cover the entire spectrum between world class dining, and the nostalgic dining of Big Sur in the 1950's and 60's that take you back to the days before Big Sur was on the world wide travel "To do" list. There are places here where you can enjoy an outstanding meal that rivals the best of the big city, while you take in the unlike city views of blue water and the ambiance of pastoral hillsides. There are also places tucked away in canyons that were built with local lumber and driftwood from the sea. 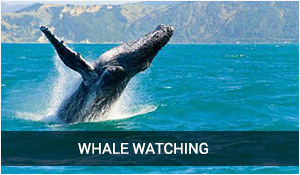 Happily for many, you will also find the small cafes and restaurants that cater to the dollar wise traveler prefering the natural scenery, over your fellow travelers well prepared halibut. 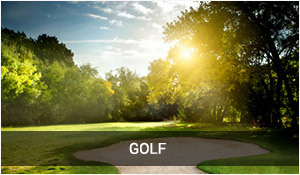 It's all here ... just a matter of discovery and a decision about your own personal preferences! Views To Remember From This Hillside Restaurant! The Restaurant At Ventana -Perched 1200 feet above the waters of the Pacific Ocean with enchanting views of the entire southern Big Sur coast, this restaurant has it all! 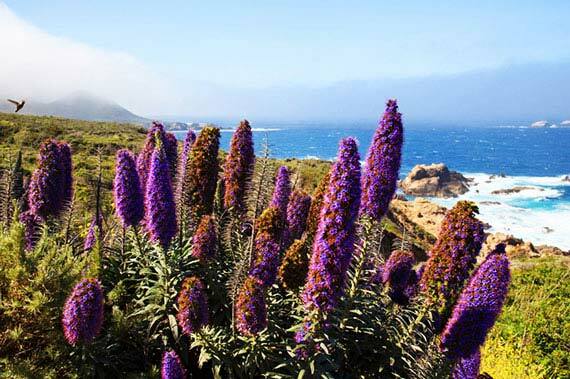 These are the big four Big Sur restaurants where with one exception, you will find both the picturesque views that make Big Sur so popular, and the cuisine that makes us all salivate. 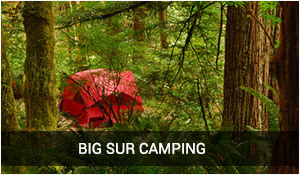 Some on the list are surprisingly not expensive at all, but still provide that Big Sur experience that diners crave. Others have that WOW factor and are destinations you will long remember but that will also take any fluff out of your wallet. Everything in Big Sur is pricey, but you have found youselves in one of the most sought after places to visit in the entire world. 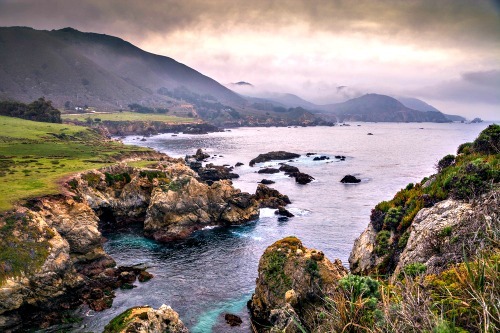 Big Sur is the 6th most visited destinatiion in the United States, so you might savor these priceless moments and try not to cringe when the check arrives. 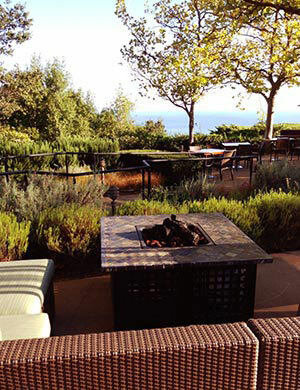 Nestled on top of a hillside and tucked into a redwood forest with long southerly views of the Big Sur coastline, the Ventana Restaurant is a great place to dine on one of your first day here. Somehow it gets you in the right mindset for what is to come. 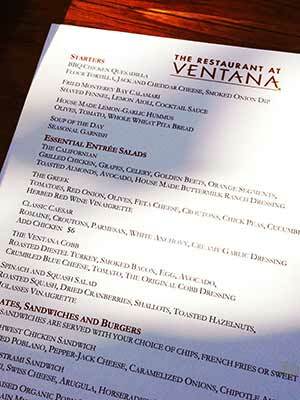 Ventana has wonderful views, a nice variety of inspired food and is usually not too crowded especially on weekdays. Sierra Mar is rated by Zygat and a host of others as one of the best places to go anywhere for a memorable dining experience. This Big Sur restaurant sits on the edge of a cliff and if you plan well, and are here at sunset, your romantic dining experience is all but guaranteed. 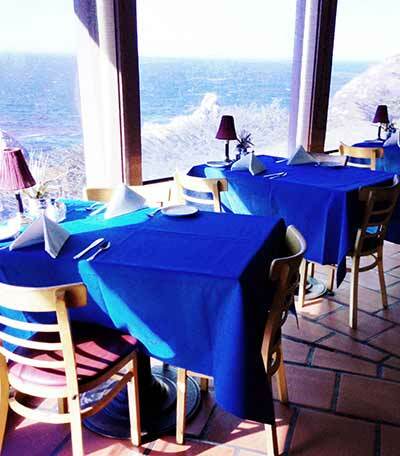 The Rocky Point Restaurant sits on a rugged point of the Pacific where crashing waves lap at the cliffs just 50 yards below your feet. Dine on the deck or inside with glass walled views. 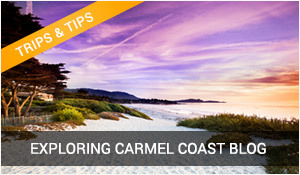 Rocky Point is a short drive from Carmel just as you enter the northern edge of Big Sur. Turn right soon after the famous Bixby Creek Bridge. It's an abrupt turn and a steep drive down to the restaurant but it's a great place. The story of Nepenthe and the history od how it appeared at this location is great fodor over conversation ... just ask your waiter. 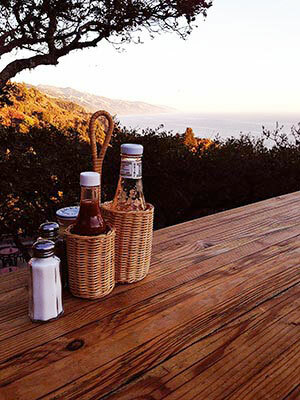 Nepenthe is one of the most popular casual dining locations anywhere in Big Sur. 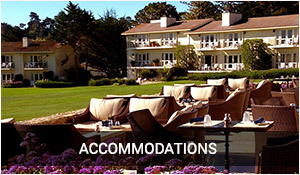 Enjoy their "Ambrosia Burger", a basket of fries, a glass of wine or beverage, and your set for hours of good conversation, classic casual dining, and the never ending stunning views of Big Sur. 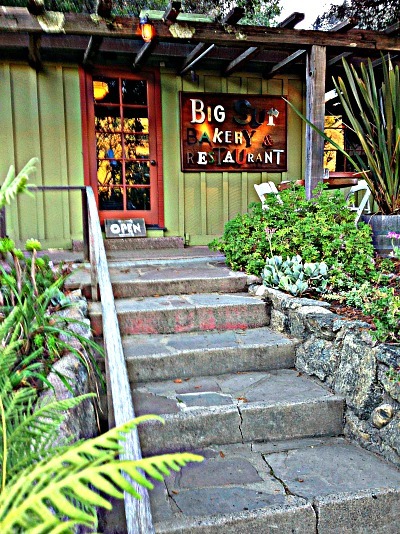 Both the Big Sur Bakery and Restaurant have a cult following here ... just check any online review sites. In this tiny building built in 1936, homemade croissants and muffins are prepared for morning guests, and a full dinnner fare with some clever dishes, is available in the evening. Maybe you could start your day with a little homemade apple struddel or fresh baked bread! 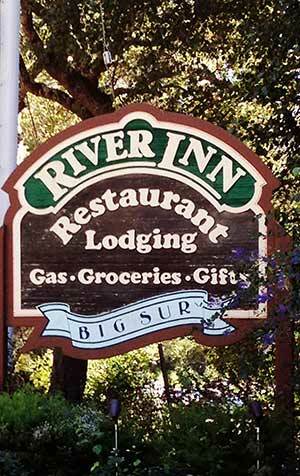 The Big Sur River Inn And Restaurant sits right along the Big Sur River in the middle of town nestled among ancient redwoods. 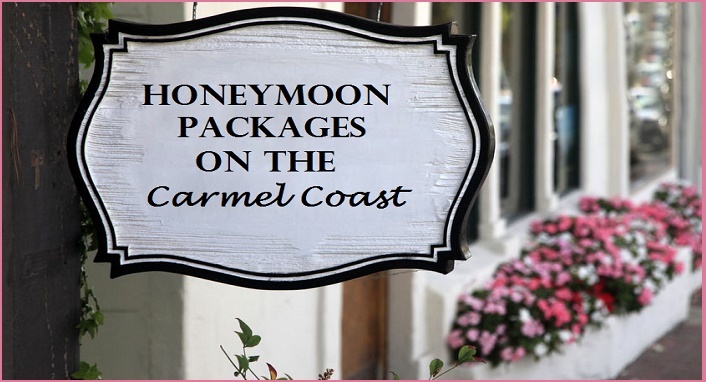 If your looking for a hearty breakfast or lunch without anything really fancy, and aren't expecting an ocean view, then this Big Sur restaurant might be a good place for a quick meal and some interesting insight into the local community. Stop by on Sundays for music and a BBQ lunch on the lawn. The RoadHouse Restaurant in BIg Sur is a unique find. The reputation here for attentive, friendly service and really really good food is well deserved. If you don't mind a restaurant without spectacular views, but do want great food that rivals the flavor of the big boys, then make sure you stop here for a real treat! No Fantastic Views ... Only Outstanding Food! 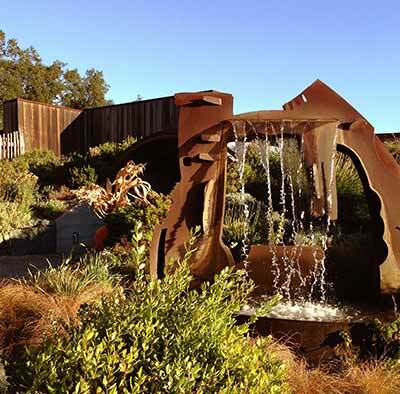 Of all the restaurants in Big Sur, I believe that Deetjens Big Sur Restaurant is the most romantic and interesting of all the restaurants that serve the Big Sur area. This is the place that was built by Grandpa Deetjen back in the mid 30's. Built from local lumber and beach driftwood, this Scandanavian settler built something he was very proud of. Unique to be sure, the restaurant is about as chic and romantic as it gets. 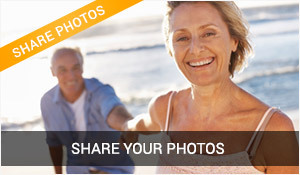 When I was there I stayed in "Grandpa's" room an dit was fun. We had dinner later that night just across in Deetjens wildly popular dining room It was a fabulous meal with candle light and a few bats hovering around the ceiling rafters while we enjoyed our meal which made for grteat conversations and happy times. 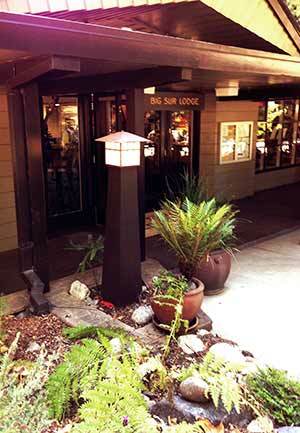 The Big Sur Lodge Restaurant just inside the doors of the lodge at Pfeiffer Big Sur State Park is a laid back place for breakfast or lunch. Management here changes frequently and so does the food. The restaurant sits inside the lodge with floor to ceiling windows with nice views of the redwoods outside.